Can I make a huge claim? I think Kuala Lumpur, the capital city of Malaysia, is probably my most favourite city out of the half-dozen cities I’ve lived in so far! So now you know where this list of the best day trips from Kuala Lumpur is coming to you from – straight from the horse’s mouth. Having lived, studied and worked in Kuala Lumpur for a long time, it is safe to say that I had started feeling quite like a local. Kuala Lumpur is undoubtedly a beautiful city to travel to and is your perfect gateway to Southeast Asia. The city offers an eclectic mix of sights, sounds, tastes and all things Asian. But it would be an absolute shame if you restrict yourself to just the city and not explore beyond. In my opinion, taking a few day trips from Kuala Lumpur is one of the best ways to explore a side of Malaysia you wouldn’t immediately encounter in the capital city. These weekend getaways near Kuala Lumpur were probably how I caught the travel bug in the first place. Not only did they open up more opportunities for me to explore new places over the weekends, they also made me fall in love with Malaysia. It truly made me believe there’s so much more to the country than what most travel guides tend to showcase. Whether you are a foodie looking for new gastronomic experiences, whether you are one who can’t let a weekend pass by without hiking or you just want to get away from the commotion of city life – a day trip from KL will cater to all your needs. So the next time you’re in the city with a few extra days to spare, instead of pondering over the things to do in Kuala Lumpur, hop on a bus or a cab and venture out to witness a heady mix of Malaysian culture, nature, and architecture. While you are in KL, do check out these popular Instagram-worthy spots in the city! Bukit Fraser or Fraser’s Hill is a small hilly region about 100 kilometres away from Kuala Lumpur. 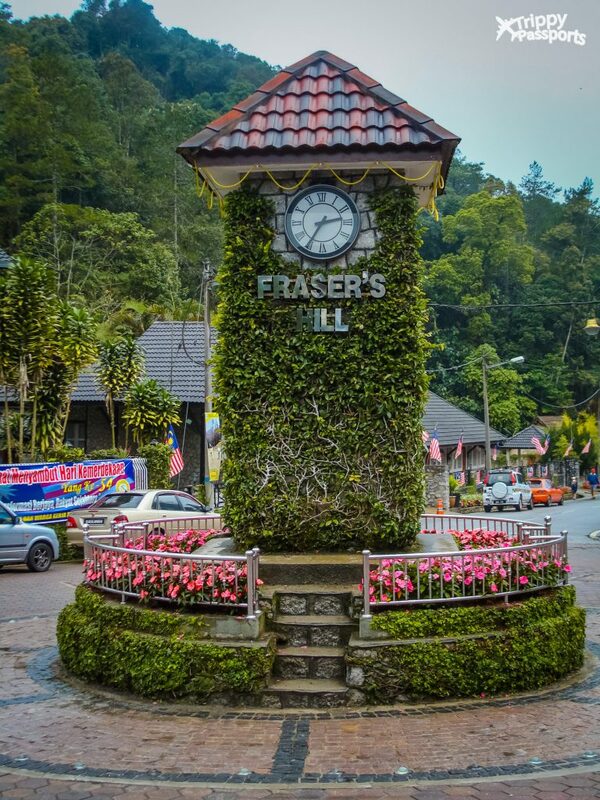 Originally built as a British colonial resort, Fraser’s Hill still maintains its old charm. The town centre almost resembles an English village square, with an iconic central clock tower in place. This is also the part of the town which gets the most activity and the best way to experience it is by foot. Walk around the place and admire the scenic surroundings while breathing is crisp, fresh air, or find a spot at one of the restaurants to spend a few hours of leisure. For those of you looking for a little more adventure and activity, Fraser’s Hill also has several hiking trails you can explore. They are beautiful and allow you to connect with nature. Expect to find small waterfalls and hundreds of species of birds on your way uphill and turn your day trip from KL truly meaningful. 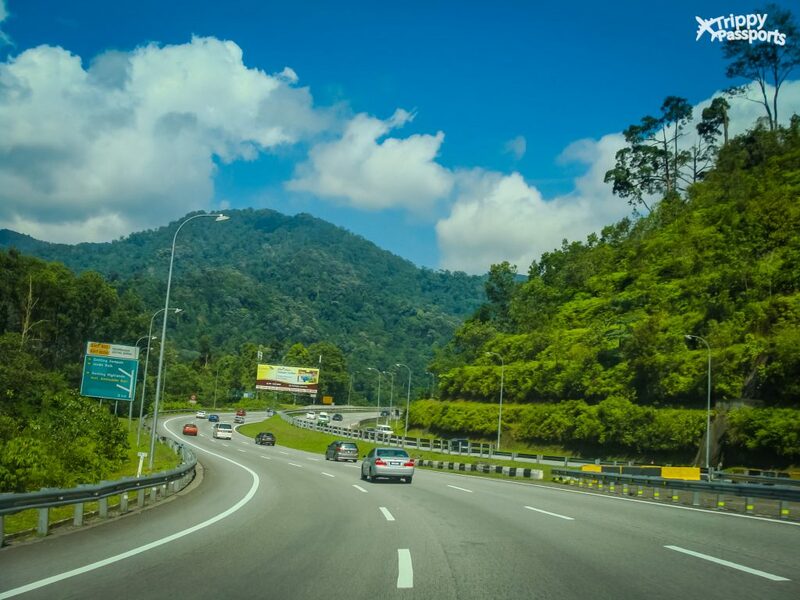 How to reach: The most convenient way to reach Fraser’s hill is by hiring a cab from Kuala Lumpur since there are no direct public buses that can take you there. 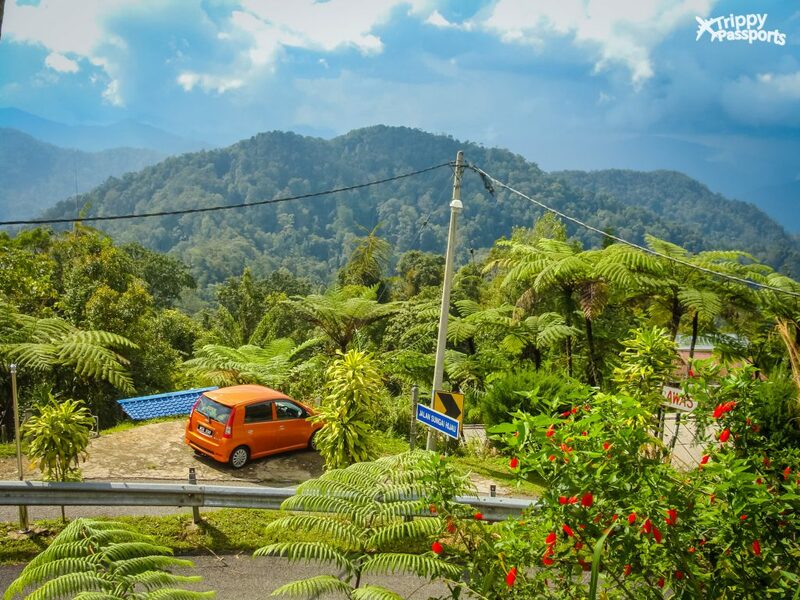 You can also look into hiring a self-driven vehicle for the day if you want to be a little more adventurous or simply book a hasslefree tour to Fraser’s Hill here! Located about an hour’s drive from Kuala Lumpur, Kuala Selangor is an underrated day trip destination you’ve got to check out. This quaint little town is home to one of the largest colonies of fireflies in the world! Post 7 pm, millions of fireflies come out and light up the forests surrounding the Selangor River. A starry affair, in the truest sense! Imagine slowly rowing down the river while watching the magical fireflies in full bloom in the adjacent forests. This is probably not what you had imagined your visit to KL would entail, but trust me, this is worth every bit of effort. Kuala Selangor also has several small seafood restaurants that serve delicious, fresh food, which you can try after your little river cruise. So if you are planning a short day trip from KL, a Kuala Selangor day trip is a must in your itinerary. How to reach: Take a bus from Kuala Lumpur’s Puduraya bus station to Kuala Selangor bus station. The journey will take about 2 hours. 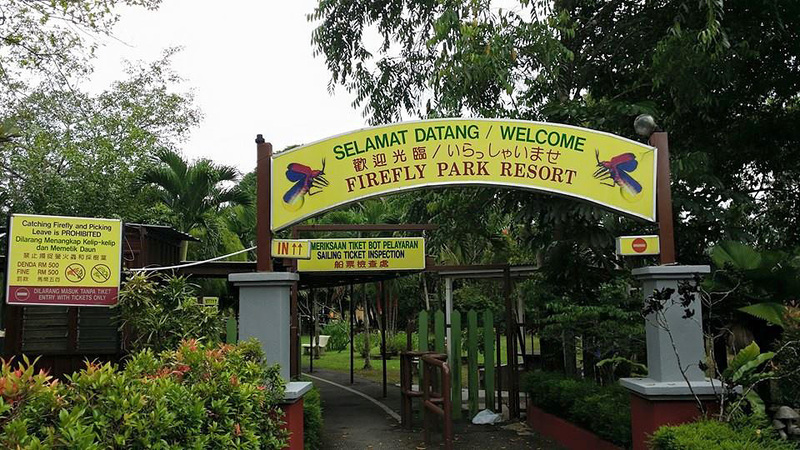 From there, you can take a cab to reach the firefly park. Alternatively, hire a taxi from Kuala Lumpur itself at a pre-fixed rate to drop you at the firefly park and bring you back. You can also book a day trip to Kuala Selangor here, complete with a sumptuous seafood dinner. All you beach bums, time to rejoice! Finally a beach-side getaway from Kuala Lumpur. This small town, about 100 kilometres away from the city is the perfect spot to head to if you’re looking for some sun, sand and sea. Not that there’s any lack of sun in Kuala Lumpur, but sunshine always feels better when you’re on the beach, right? 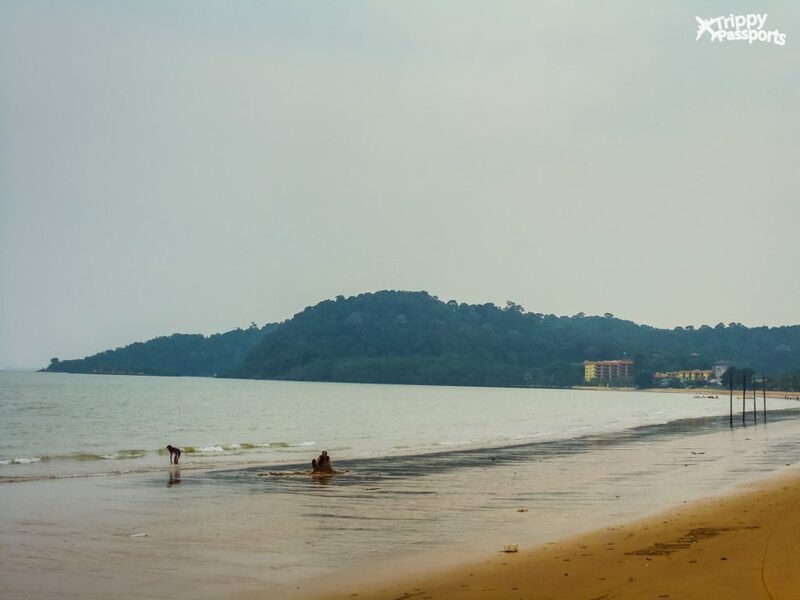 😀 My favourite way to unwind on a day trip from KL to Port Dickson (or PD, as the locals like to call it) is to gorge on delicious seafood and spend a lazy day on the popular Blue Lagoon beach. A quick swim in the sea is also good if you’re looking for some respite from the heat. If you’re keen on engaging in more activities, the hike up to the Cape Rachado lighthouse is great fun! The lighthouse itself does not allow entry to visitors, but you can hike through the wild jungle trail to reach the hilltop for spectacular views of the Indian Ocean. Totally worth the effort! How to reach: To reach Port Dickson town, take the KTM Komuter train from KL Sentral to Seremban station. 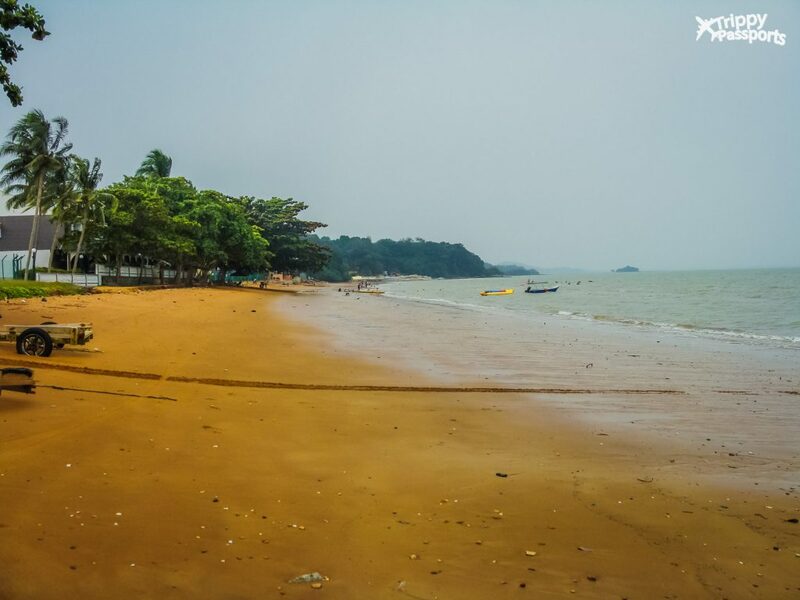 Once you get there, hop on a bus that’ll take you to Port Dickson. Alternatively, here’s a great way to book a day trip to Port Dickson. Bukit in Malay means hill. So, if you’re looking for some respite from the city heat, head uphill to this beautiful little town called Bukit Tinggi. The 2 most popular attractions here are a French-style resort called Colmar Tropicale and a Japanese village. 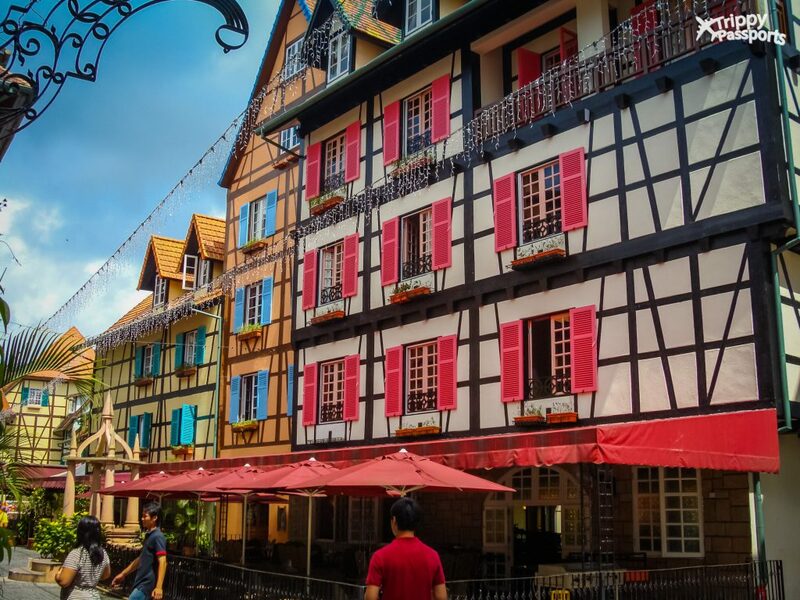 A walk through the beautifully designed Colmar Tropicale will make you feel like you’ve been transported to a small French village, with its cobbled streets, French cafes and the distinct architecture. Spend some time walking around exploring the resort and then sit down for a sumptuous meal at one of the cute French-style cafes. But there’s a lot more you can do here than just strolling around, provided you are up for some legwork. 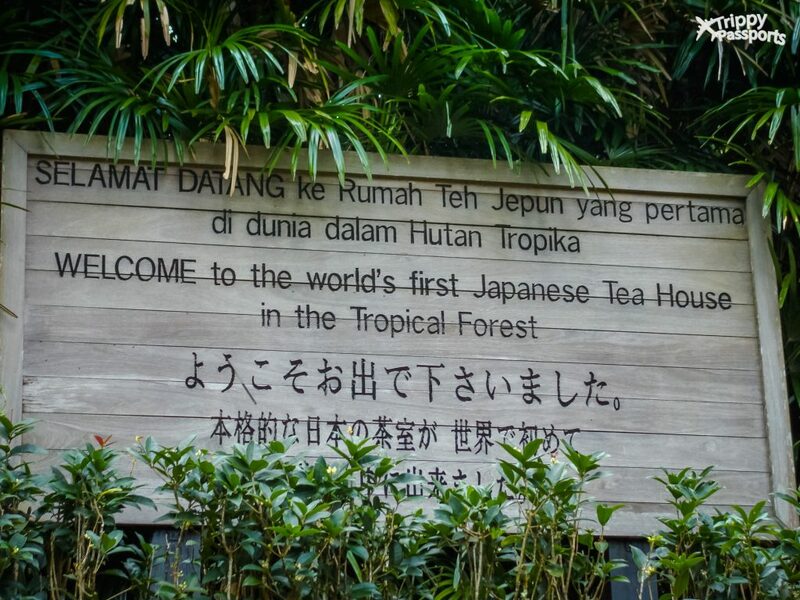 Take a fun hike up to the Japanese Village located 3500 feet above sea level, amidst lush forest and a mist of clouds. Inside the village, there’s a spa too, if your legs need some pampering after all the walking. Or you could even head to the Tea House for a taste of authentic Japanese tea while you admire the natural abundance around you. If you want, you could even turn this day trip from Kuala Lumpur into an overnight getaway. Spend a night at the Berjaya resort in Colmar Tropicale and extend your sojourn with the mountains! How to reach: Unfortunately, there are no public buses that ply directly to Bukit Tinggi, but there is a shuttle bus that runs from Berjaya Times Square shopping mall in Kuala Lumpur to Colmar Tropicale every day at 10 am, 1 pm and 5 pm. The other option is, of course, to hire a cab from the city for the day. 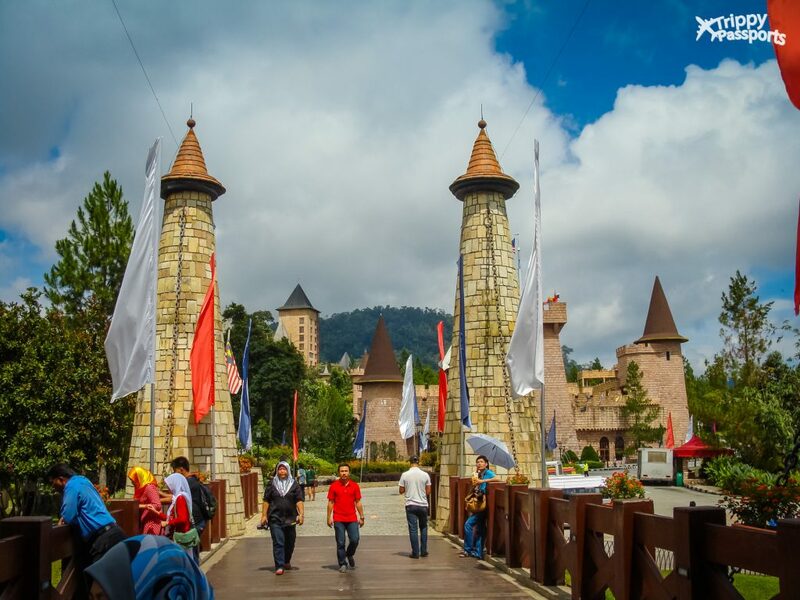 To cut down on those hassles, you could also consider booking a complete organized tour to Bukit Tinggi. This is appearing last on this list, but is probably one of the most popular one day trip in Malaysia from Kuala Lumpur! Whether you’re looking for a quick day trip from KL or a more extended weekend getaway, Malacca will appeal to all kinds of travellers. A UNESCO World Heritage city, Malacca is located within 2 hours of driving time from Kuala Lumpur and is a lovely place to explore, bustling with activity all year round. An erstwhile Portuguese colony, the town has retained the unique Portuguese influence on its culture and architecture. The most famous attraction of this small town is undoubtedly, Jonker Street. The Jonker Walk is famously known for its lively night markets and the myriads of shops selling everything from handicrafts to snacks. Once you are done taking a leisurely stroll on this street, either head to the nearby beach or take a look at a few historic sites. The A’Famosa Fort and the Christ Church are the two other most popular tourist attractions in Malacca. If all this walking makes you hungry, find a cosy little home-style restaurant or hop across a few of Malacca’s stylish cafes to taste the lip-smacking Nyonya cuisine – a fine blend of the Chinese and Malay styles of cooking, unique to this part of the country. How to reach: The best way to get from KL to Malacca is via buses that ply from Kuala Lumpur all day, every day. You can easily book a bus ticket online where you can also find the boarding and drop off points based on which bus you choose. Alternatively, check out this full day guided tour of Malacca city and travel hasslefree! If you have been thinking of exploring off-beat activities in Malaysia, a short day trip from KL is a good place to start. Travelling on public transport in Malaysia is quite safe. So whether you are a solo female explorer or one to travel with their partner, these Kuala Lumpur day trips are a must-do! 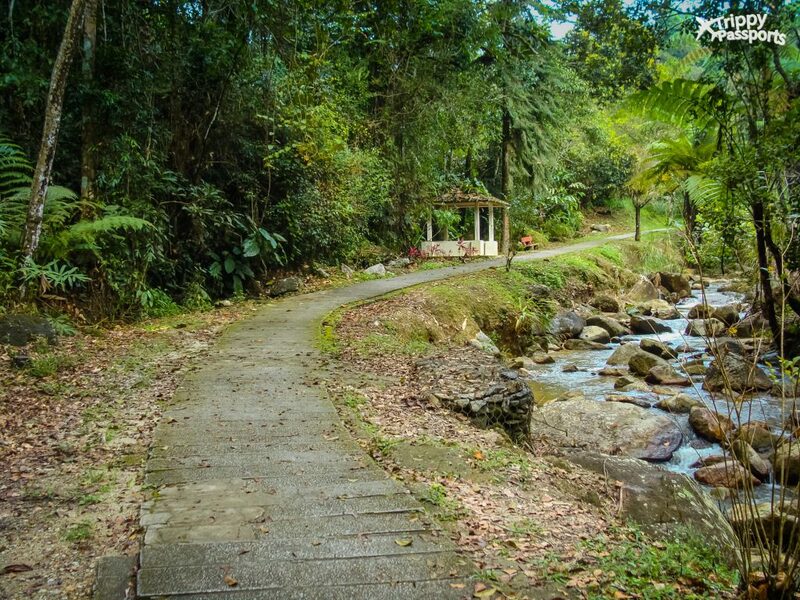 They offer the perfect opportunity for you to get outdoor amidst lush greenery and also get acquainted with the local food and culture of Malaysia. If you are spending 3-4 days in Kuala Lumpur, I suggest you spare at least one day to explore the outskirts of the city. Pick a spot that suits your taste and don’t be afraid to wander away. You’ll be surprised at how much you’ll discover in just a day and will be left craving for more of these short trips from Kuala Lumpur! Haven’t found the right one and looking for more options for excursions? Check out more day trips from Kuala Lumpur here. 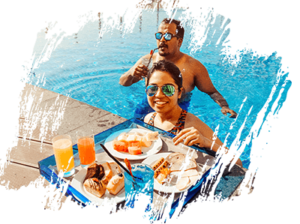 PreviousPrevious post:7 Things To Do In Mauritius On A Budget – Our Top PicksNextNext post:The Only 3-Day Abu Dhabi Itinerary You’ll Ever Need! We took a trip to Melaka during our stay in KL last year and thought it was super quaint. I had no idea there were so many other cute options for side-trips! We actually just got back from another trip to Malaysia (Penang). Absolutely love the country!! Oh wow, thanks for sharing! Really liked KL when I visited a few years ago. Went on a day trip white water rafting and it was the highlight of my trip! Would really loved to return and see more of Malayasia. Awesome tips!! Especially Malacca, looks stunning. I love your photos too! Wish I would have seen this post earlier this year. We went to KL for a long weekend between destinations and just stayed in the city. Cool to see that there are so many little side trips to take next time. Thanks! We were in Kuala Lumpur in 2012 but we didn’t explore the outskirts. We really missed out!! Now, we have a reason to go back. Thanks for the info! This is such an awesome guide, I love guides that focus on the non touristy part! I wish I had read this before my time in KL. If I ever go back I am for sure bringing this guide with me! thank you!! I haven’t seen a firefly in ages. I would have loved to go Kuala Selangor. Loved this informative post. Local guides are the best! I would never have learned about any of these places on my own. It is also great to get away from the super popular areas and experience some quieter and authentic spots. That’s really a comprehensive guide for day trips from Kuala Lumpur. When I saw that pic of Colmar Tropicale, I thought you had accidentally chosen the wrong photo because this looks really exactly like Colmar in France’s Alsace region. I love these suggestions! Very good overview to help people planning a trip. Happy travels! I loved Fraser Hill and the Colmar Tropicale-what a neat addition there! Your photos are quite inviting! I haven’t been to Asia yet but KL seems to have some amazing day trips. I must add it to my list now. Frasers Hill looks awesome! Plus it’s my surname haha. So I’d have to stop by. Thanks for the tips! Your photos look like postcards they’re so beautiful! Especially that second shot of Fraser’s Hill. Just gorgeous! Malaysia, truly Asia 🙂 its been on my bucket list for a while.. you highlight the surrounding interests so well! So, I definitely never knew there was so much to do in Kuala Lumpur! Port Dickerson sounds like the ideal place for a woman who enjoys the beach. When we were in Singapore, it just kinda tempting to go to Malaysia since it’s very near. If I were to spend a day there, it would probably be in Malacca. Loved the post as it packs in a lot of knowledge of the area. Your knowledge of KL and its surroundings makes the information really credible and reliable. There are some really interesting places to head away from KL. My favourites seem to be Port Dickson and Malacay. These all look like worthwhile day trips from KL. I’ve been to KL many times but only been to Melaka from this list. I’d love to visit Bukit Tinggi to photograph those colourful houses. KL looks like a great place to live to take advantage of these cool day trips. No wonder you loved it there. I had no idea there was such a variety of stuff to see so close to KL. Didn’t know there were so many fun day-trip destinations from Kuala Lumpur! Definitely adding Bukit Tinggi to my list and I loved your directions! Thanks for the helpful guide!! Such a nice and great post about with perfect sound for Kuala Lumpur. This Local’s Guide is really appreciable which give a perfect guidance for Kuala Lumpur. I was going Melacca a few year ago..
What an informative post! We will be there next year so this info will be very handy!